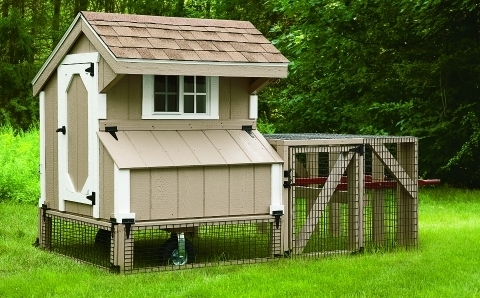 The tractor style hen house is conveniently movable cage and run combo. This allows you to keep the chickens on fresh grass, by easily moving it on to the next spot. Comes painted with duratemp siding or board and Batton siding for a more rustic feel. Available sizes 3′ x 4′, and 4′ x 4′. Also available in lean to styles.